Retinal dopamine is a critical modulator of high acuity, light-adapted vision and photoreceptor coupling in the retina. Dopaminergic amacrine cells (DACs) serve as the sole source of retinal dopamine, and dopamine release in the retina follows a circadian rhythm and is modulated by light exposure. However, the retinal circuits through which light influences the development and function of DACs are still unknown. Intrinsically photosensitive retinal ganglion cells (ipRGCs) have emerged as a prime target for influencing retinal dopamine levels because they costratify with DACs in the inner plexiform layer and signal to them in a retrograde manner. Surprisingly, using genetic mouse models lacking specific phototransduction pathways, we find that while light influences the total number of DACs and retinal dopamine levels, this effect does not require ipRGCs. Instead, we find that the rod pathway is a critical modulator of both DAC number and retinal dopamine levels. Dopamine is released in the retina by dopaminergic amacrine cells (DACs), and follows a circadian rhythm with high dopamine levels occurring during the day and low levels at night (Doyle et al., 2002). Retinal dopamine plays a role in resetting the retinal circadian clock and serves as a regulator of high acuity, light-adapted vision (Besharse and McMahon, 2016; Jackson et al., 2012; Prigge et al., 2016) and photoreceptor coupling in the retina (Jin et al., 2015; Ribelayga et al., 2008). For example, mice lacking tyrosine hydroxylase (TH), the rate limiting enzyme in dopamine synthesis, show deficits in contrast sensitivity, acuity, and retinal circadian rhythms that are reversed by administration of L-DOPA (Jackson et al., 2012). DACs receive light input from rods, cones, and the melanopsin-expressing intrinsically photosensitive retinal ganglion cells (ipRGCs). DACs have been shown to respond to light through the rod pathway, and the rod pathway has been implicated in DA regulation. Likewise, DACs respond to light through the cone pathway (Zhang et al., 2008; Zhao et al., 2017). ipRGC dendrites co-stratify with DACs within the IPL during development and adulthood (Matsuoka et al., 2011; Vugler et al., 2007), and they signal in a retrograde manner to DACs (Zhang et al., 2008; Zhang et al., 2012), which has made them a likely candidate for regulation of retinal dopamine. Despite the importance of light signaling in regulating dopamine levels, the cell types and circuits through which light influences DAC development and function have not been identified. We therefore sought to identify whether and through which photoreceptive pathways light exerts these effects. We find that light exposure is indeed required to set the number of TH-positive (TH+) cells and dopamine levels in the retina, and that rod phototransduction is critical for this process. Surprisingly, though ipRGCs have arisen as a prime candidate for regulation of dopamine in the retina, retinas lacking melanopsin phototransduction or with ipRGCs ablated show normal dopamine levels and TH+ cell number. Collectively, our results indicate that rod signaling, through cell types other than ipRGCs, is primarily responsible for the effects of light on DAC development. We first tested whether exposure to a 12:12 light:dark cycle influences the number of TH+ amacrine cells in the retina. To do this, we performed immunohistochemistry for TH and compared the number of TH+ cells in the retinas of animals that were reared in constant darkness from conception to those reared on standard 12:12 cycles (Figure 1D). Rearing in constant darkness resulted in decreased numbers of TH +cells at P14 (DD: Mean ± SEM = 580.8 ± 8.6 cells, n = 15 retinas; LD: Mean ± SEM = 643.7 ± 8.2 cells, n = 6 retinas; Unpaired t-test, p = 0.0004) (Figure 1A). This decrease persisted when animals were dark-reared to adult stages (DD: Mean ± SEM = 567.3 ± 10.2 cells, n = 6 retinas; LD: Mean ± SEM = 648.5 ± 17.5 cells, n = 6 retinas; One-Way ANOVA, p = 0.0002, Dunnett’s multiple comparisons test) (Figure 1B). Interestingly, we found that this decrease in TH+ cell number in the adult retina persisted even after dark-reared mice were placed in LD at P14, demonstrating that this decrease in TH+ cell number could not be rescued by subsequent exposure to a normal LD cycle after eye opening (LD Rescue: Mean ± SEM = 541.8 ± 5.6 cells, n = 4 retinas; One-Way ANOVA, Dunnett’s multiple comparisons test) (Figure 1B). 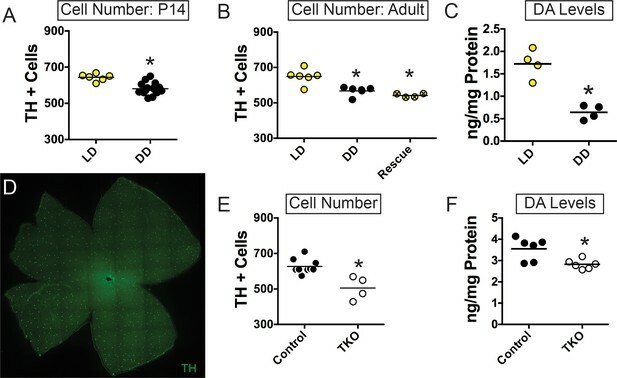 In support of decreased TH+ cell number, dopamine (DA) levels were significantly reduced in DD reared animals (DD: Mean ± SEM = 0.6 ± 0.08 ng/mg, n = 4 retinas; LD: Mean ± SEM = 1.723 ± 0.16 ng/mg, n = 4 retinas; Unpaired t-test, p = 0.003) (Figure 1C). Light exposure during early retinal development is required to set TH-positive cell number and dopamine levels. (A–B) TH+ cell number in animals bred and reared in either LD (yellow circles) or DD (black circles) from conception at P14 (n = 6 LD, n = 15 DD) (A) or Adult (n = 6 LD, n = 6 DD) (B) stages. Adult TH+ cell number could not be rescued by moving animals from DD to LD at P14 (hatched yellow circles, n = 4) (C) DA levels in adult retinas from animals reared in LD (yellow circles, n = 4) or DD (black circles, n = 4). (D) TH+ cells in whole mount WT adult retina (E–F) TH+ cell number (n = 9 Control, n = 4 TKO) (E) and DA levels (n = 6 Control, n = 6 TKO) (F) in Control (black circles) and TKO (open circles) adult retinas. *p < 0.05. Bars on plots represent mean. If light signaling is occurring through one of the three known photoreceptors (rods, cones, or ipRGCs), then rendering all three of these photoreceptor types insensitive to light through genetic perturbation of phototransduction cascade components (Gnat1-/-; Gnat2cpfl3/cpfl3; Opn4-/-, hereafter referred to as TKO for ‘triple knockout’) should mimic the phenotype we observed in DD reared animals. Indeed, TKO retinas had significantly reduced number of TH+ cells (TKO: Mean ± SEM = 505.0 ± 32.8 cells, n = 4 retinas; Control: Mean ± SEM = 627.4 ± 13.5 cells, n = 9 retinas; One-Way ANOVA, p < 0.0001, Dunnett’s multiple comparisons test) and significantly reduced DA levels (TKO: Mean ± SEM = 2.82 ± 0.09 ng/mg, n = 6 retinas; Control: Mean ± SEM = 3.55 ± 0.22 ng/mg, n = 6 retinas; One-Way ANOVA, p < 0.0001, Dunnett’s multiple comparisons test) compared to control retinas (Figure 1E–F). These results indicate that light is a critical modulator of TH+ cell number and resting DA levels in the retina during development and into adulthood. We next wanted to determine which photoreceptor types are involved in setting TH+ cell number and DA levels during development (Figure 2A). To do this, we counted TH+ cells in retinas from littermate mice lacking functional rod (Gnat1-/-, hereafter referred to as RKO), cone (Gnat2cpfl3/cpfl3, hereafter referred to as CKO), or melanopsin (Opn4-/-, hereafter referred to as MKO) phototransduction cascades (Figure 2B). Despite reports of ipRGC influence on DA-dependent retinal physiology (Prigge et al., 2016; Zhang et al., 2008; Zhao et al., 2017; Zhang et al., 2012; Qiao et al., 2017), we found that MKO and CKO mice showed no significant change in TH+ cell number (MKO: Mean ± SEM = 615.3±55.5 cells, n = 6 retinas; CKO: Mean ± SEM = 708.6 ± 30.74 cells, n = 9 retinas; Control Mean ± SEM = 627.4 ± 13.5 cells, n = 9 retinas; One-Way ANOVA, Dunnett’s multiple comparisons test) or DA levels (MKO: Mean ± SEM = 3.63 ± 0.15 ng/mg, n = 6 retinas; CKO: Mean ± SEM = 3.88 ± 0.07 ng/mg, n = 6 retinas; Control Mean ± SEM = 3.55 ± 0.22 ng/mg, n = 6 retinas; One-Way ANOVA, Dunnett’s multiple comparisons test), though CKO mice showed a trend toward increasing numbers of TH+ cells (Figure 2C–D). These data indicate that lack of melanopsin or cone phototransduction does not influence basal retinal DA as previously suggested (Dkhissi-Benyahya et al., 2013). Surprisingly, RKO mice showed a significant decrease in both TH+ cell number (RKO: Mean ± SEM = 518.5 ± 29.3 cells, n = 9; Control Mean ± SEM = 627.4 ± 13.5 cells, n = 9; One-Way ANOVA, p < 0.0001, Dunnett’s multiple comparisons test) and DA levels (RKO: Mean ± SEM = 2.92 ± 0.09 ng/mg, n = 6 retinas; Control Mean ± SEM = 3.55 ± 0.22 ng/mg, n = 6 retinas; One-Way ANOVA, p < 0.0001, Dunnett’s multiple comparisons test). Our data from RKO tracks closely with our results from DD reared animals and TKO animals (Figure 1), indicating that rods in particular play a critical role in setting TH+ cell number and DA levels in the developing and adult retina. Rod signaling influences TH-positive cell number and dopamine levels through ipRGC-independent pathways. (A) Diagram depicting potential pathways by which light information could reach DACs (1. Via melanopsin signals relayed by ipRGCs, (2. Via rod signals relayed to DACs, (3. Via cone signals relayed to DACs, or (4. Via rod, cone, and/or melanopsin signals through ipRGC-dependent pathways. Dashed arrows represent indirect influence through multicellular circuits while solid arrows represent direct synaptic connectivity between subtypes. (B) Diagram depicting signaling pathways disrupted in MKO, RKO, CKO, and DTA mouse lines. Dashed arrows represent indirect influence through multicellular circuits while solid arrows represent direct synaptic connectivity between subtypes. (C–D) TH+ cell number and DA levels in Control (black circles, n = 9), MKO (blue circles, n = 6), RKO (red circles, n = 8), and CKO (green circles, n = 9) retinas from adult littermates. (E–F) TH+ cell number (n = 8 Control, n = 6 DTA) and DA levels (n = 6 Control, n = 6 DTA) in Control (black circles) and DTA (gray circles) retinas from adult littermates. (G) TH+ cell anatomy in WT and DTA adult retinal sections. We observed no morphological differences between TH+ cells in these two mouse lines. DA: dopamine, DAC: dopaminergic amacrine cell, MKO: animals lacking melanopsin phototransduction, RKO: animals lacking rod signaling, CKO: animals lacking cone signaling, DTA: animals where ipRGCs are ablated through expression of diphtheria toxin. Scale bar in (G) is 50 μm. *p < 0.05, bars on plots represent mean. Rods and cones signal to DACs through bipolar cells (Zhang et al., 2008; Qiao et al., 2016) as well as in a retrograde fashion via ipRGCs (Zhang et al., 2008; Zhao et al., 2017; Zhang et al., 2012). Thus, it is possible that though melanopsin phototransduction itself is not required for normal TH+ cell number and retinal DA levels, that the rod-based signals are still reaching DACs via ipRGCs (Figure 2A). If this is the case, then ablating ipRGCs during development should phenocopy our results from RKO animals (Figure 2B). To test this, we counted TH+ cells and measured DA levels in retinas from animals where ipRGCs are ablated early in development (Opn4DTA/DTA, hereafter referred to as DTA animals) (Figure 2B) (Chew et al., 2017). Surprisingly, ablation of ipRGCs did not affect the number of TH+ cells (DTA: Mean ± SEM = 605.2 ± 10.5 cells, n = 6 retinas; Control: Mean ± SEM = 582.6 ± 10.1 cells, n = 8 retinas; Unpaired t-test, p = 0.1522) or retinal DA levels (DTA: Mean ± SEM = 3.61 ± 0.27 ng/mg, n = 6 retinas; Control: Mean ± SEM = 3.31 ± 0.23 ng/mg, n = 6 retinas; Unpaired t-test, p = 0.4188), indicating that ipRGCs are not the relay for rod-dependent signals influencing these processes (Figure 2E–F). Additionally, we find that TH+ cell stratification also appears normal in DTA retinas, providing further support for normal DAC development in the absence of ipRGCs (Figure 2G and Figure 2—figure supplement 1). These data indicate that rod phototransduction through non-ipRGC pathways is the critical regulator of both TH+ cell number and resting retinal DA levels (Figure 3). Summary schematic for light-dependent influences on TH-positive cell number and retinal dopamine levels. Rods signaling serves to increase TH+ cell number and DA levels through ipRGC-independent pathways. Dashed arrows represent indirect influence through multicellular circuits while solid arrows represent direct synaptic connectivity between subtypes. Red represents rod pathway signals, green represents cone pathway signals, and blue represents signals arising from melanopsin phototransduction. Neither ipRGC relay of rod, cone, nor melanopsin signals nor the cone pathway influence TH+ cell number or retinal DA levels. The rod pathway serves to increase the number of TH+ cells and increase retinal DA levels. R: Rod, C: Cone, DAC: dopaminergic amacrine cell, DA: Dopamine. Our findings indicate that rods are the major photoreceptor class in the retina regulating the number of TH+ cells as well as resting retinal DA levels, and that they are doing so through ipRGC-independent pathways (Figure 3). These findings are consistent with reports that DACs receive rod/cone pathway input relayed via bipolar cells (Zhao et al., 2017; Qiao et al., 2016). Specifically, a recent report demonstrated that rod responses were consistently detectable in electrophysiological recordings from DACs across multiple luminance levels. Cone responses, however, were detectable at lower light intensities in the dorsal versus ventral retina, while melanopsin-based responses were detectable only in the dorsal retina (Zhao et al., 2017). Our results in DD and RKO animals are roughly parallel, suggesting that rods are the primary drivers of the defects observed in DD. We did observe a proportionally larger DA decrease in DD, which could indicate that there are other pathways at play. However, this larger DA decrease could also be due to the higher light levels that the LD animals were reared in compared to the Controls in the RKO experiment. RKO animals have been shown to have some retinal degeneration starting at 4 months, which could also explain the differences in magnitude (Calvert et al., 2000). This is unlikely because dark-reared animals do not have retinal degeneration, but still exhibit reduced TH+ cell number and decreased retinal DA levels (Brooks et al., 2014). It is also possible that these differences were due to slight genetic variability amongst cohorts because the number of DACs is closely tied to genetic background, though both of these groups were maintained on the same mixed hybrid background (see Materials and methods) (Whitney et al., 2009). Gnat2cpfl3/cpfl3 (‘CKO’) mice have been shown to retain some low sensitivity cone function (Chang et al., 2006), and our CKO mice showed a non-significant trend toward increased DAC number, indicating that cones may have some influence on DAC number. Nevertheless, because only RKO or TKO animals recapitulated the phenotype we observed in DD, our data argue that rods are the major pathway through which this occurs. That ipRGCs were not required for either TH+ cell number or setting retinal DA levels was surprising given the close apposition of DAC axons and ipRGC dendrites, as well as evidence for bidirectional signaling between these two populations and effects of melanopsin signaling on the number of other retinal cell types (Matsuoka et al., 2011; Vugler et al., 2007; Zhang et al., 2012; Rao et al., 2013). Previous work has shown deficits in the light adapted ERG of DTA animals that can be rescued by a D4 agonist (Prigge et al., 2016). There are two possible explanations for this deficit: The first is that there are differences in evoked DA release in acute light exposure but not in resting DA. As our measurements of DA were taken from light adapted animals during the animal’s subjective day, this seems unlikely. Our recent work points to a second possible explanation. 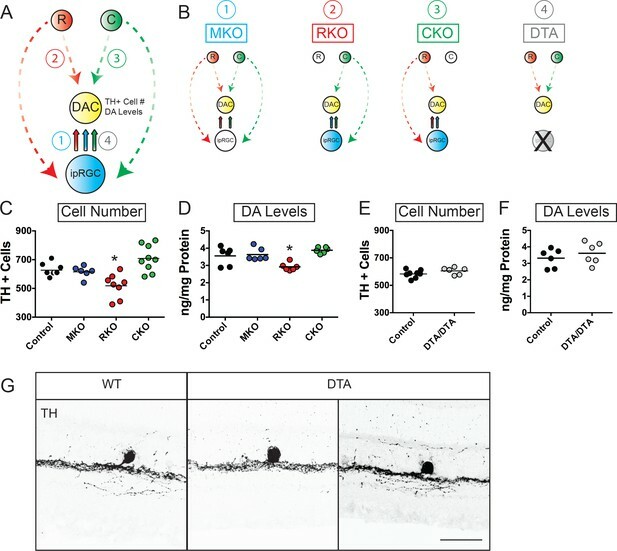 We have found that during development, DTA retinas show a down regulation of the D4 receptor, Drd4, which is expressed on cone photoreceptors (Tufford et al., 2018). Therefore, it is possible that lack of ipRGCs causes genetic alterations in the retina of DTA animals that makes individual cell populations in the retina less responsive to DA. However, we have not examined Drd4 expression levels in adult DTA versus WT retinas. It is important to note that while our data clearly indicate fewer TH+ cells in RKO and DD retinas, we were limited to the use of TH immunopositive cells as a proxy for DAC number because other currently available dopamine reporter reagents label additional and varied cell types in the retina (Vuong et al., 2015). Therefore, we were unable to determine whether the decrease in TH+ cell number truly represents a decreased number of DACs via either cell death or lack of differentiation, or whether decreased cell numbers simply represent undetectable TH protein levels in a subset of DACs. However, in the absence of sufficient TH enzyme, any surviving DACs will be unable to functionally synthesize dopamine. Thus, though we cannot clarify the reasons for the absence of TH immunolabeling at this time, it is clear that dopamine production from a subset of DACs is lost or at least severely attenuated in DD and RKO mice. In the future it will be to determine whether the actual number of DACs in RKO animals is in fact lower than in WT, or whether the levels of TH are simply undetectable in some DACs. All procedures were approved by the Animal Care and Use Committee at Northwestern University (Protocol number IS00000887). Both male and female mice were used in this study. For LD and DD experiments, F1 C57Bl6/J; 129S1/SvlmJ wild-type mice from Jackson Labs were bred to generate hybrid progeny. For manipulations of specific phototransduction cascades, mouse lines were generated from the following cross: Opn4+/-; Gnat1+/-; Gnat2+/cpfl3 X Opn4+/-; Gnat1+/-; Gnat2+/cpfl3. Each locus outside the locus of interest was either heterozygous or wild-type. Control mice were either heterozygous or wild-type at a given locus. From this cross were able to generate all MKO (Opn4-/-), RKO (‘rod knock out,’ Gnat1-/-), and CKO (‘cone knock out,’ Gnat2cpfl3/cpfl3) mice (Calvert et al., 2000; Chang et al., 2006; Altimus et al., 2010; Hattar et al., 2002) but only a single TKO (‘triple knockout,’ Opn4-/-; Gnat1-/-; Gnat2cpfl3/cpfl3) mouse due to low probability of homozygosity at every locus. We therefore used offspring from this initial mating to generate all other TKO mice used in the study. To generate Opn4DTA/DTA and the associated controls, we crossed Opn4DTA/+ X Opn4DTA/+ and utilized Opn4DTA/DTA (DTA) (Chew et al., 2017) and Opn4+/+ (Control) littermates generated from this cross for all experiments. For LD/DD experiments animals were bred and reared in a 12:12 light:dark cycle (Light intensity ~2000 lux) except in the case of the dark-reared animals, which were bred and reared from conception in light-tight chambers. Some of the dark-reared animals were placed in the Rescue group. These animals were bred and maintained in light-tight chambers until P14 and then moved to a 12:12 LD cycle (Light intensity ~2000 lux). For DD conditions, cages were changed using very dim, red illumination. For mutant studies, animals were housed in the animal facility where the light intensity was 100 – 200 lux. All animals received food and water ad libitum. Mice were euthanized at postnatal day 14 (P14) and at P50-90. Whole retinas were isolated and placed in 4% paraformaldehyde (PFA) at 4oC. Following a 1 hr incubation, retinas were then washed with phosphate buffered saline (PBS) three times for 5 min each at room temperature (RT). Blocking solution consisted of 6% goat serum in 0.3% Triton (Millipore) in PBS. Retinas were kept in blocking solution for 1 hr at RT. Retinas were then placed in primary antibody solution overnight at 4oC, at a 1:500 dilution of rabbit anti TH antibody (Millipore) in 0.3% Triton. Retinas were once again washed in PBS, and then placed in a 1:500 Alexa fluor 488 goat anti-rabbit IgG (Invitrogen) secondary antibody solution for 2 to 4 hr at RT. Retinas were washed once again and mounted onto glass microscope slides, and the coverslip was secured using Fluoromount. Slides were then stored at 4oC until imaged. For retinal sections, mice were euthanized at P14 or P30 and the eyes were removed. The cornea and lens were removed, and the isolated eyecups were fixed in 4% PFA at 4°C for 2 hr and then cryoprotected in 30% sucrose overnight. Eyecups were then mounted in OCT freezing media and stored at −20°C overnight. The retinal tissue was then sectioned at 16 μm on a Leica CM1950 Cryostat and mounted on glass slides. Sections were then washed on the slides 3 × 10 min. in PBS at RT. Retinas were then incubated in Blocking Solution (2% donkey serum in 0.3% Triton (Millipore)) in PBS for 2 hr at RT. Retinas were then placed in Primary Antibody solution (Blocking Solution + 1:1000 rabbit anti-TH). Retinas were then washed 3 × 10 min. in PBS and placed in Secondary Antibody solution (Blocking Solution + 1:500 donkey anti-rabbit IgG 488). Retinas were then washed 3 × 10 min. PBS, covered in Fluoromount, coverslipped, and stored at 4°C until imaging. For whole retina imaging, images were obtaining using Leica DM5500 SPE microscope at 100x under epifluorescent illumination. Tile scanned images were taken of the entire retina and automatically stitched together, using LAS X software. Confocal images of retinal sections were obtained at 20X magnification using a Leica DM5500 SPE microscope. Retinal images were processed using ImageJ plugin: Fiji. Total TH positive cells in each retina were counted by hand by an experimenter blinded to the genotype, and total number was recorded. Mice were euthanized at P14 and P60-90. Retinas were dissected and flash frozen using liquid nitrogen. Retinas were then placed on dry ice, stored at −80°C, and sent to the Vanderbilt University Neurochemistry Core on dry ice for analysis of dopamine levels. Samples where dopamine levels were compared directly were always quantified in the same batch to avoid inter-experiment variability. Statistics were performed using Graphpad Prism software. For pairwise comparisons, unpaired t-tests were used. For multiple comparisons, a one-way ANOVA followed by a Dunnett’s multiple comparisons test was performed. Significance was concluded when p < 0.05. n values represent number of retinas. Individual data points are shown on plots with a bar representing the mean. Journal of Biological Rhythms 31:223–243. Investigative Opthalmology & Visual Science 47:5017–5021. The Journal of Physiology 593:1597–1631. Investigative Opthalmology & Visual Science 58:4712–4721. Investigative Opthalmology & Visual Science 50:1996–2003. Thank you for submitting your work entitled "Light-dependent pathways for dopaminergic amacrine cell development and function" for consideration by eLife. Your article has been reviewed by three expert reviewers, and the evaluation has been overseen by a Reviewing Editor and a Senior Editor. The reviewers have opted to remain anonymous. The reviewers found the work interesting, but they have also raised a number of substantive questions. Based on the reviews and the follow-up discussion among the reviewers and the reviewing editor, we are requesting that you submit a revised manuscript. In particular, we think that the initial emphasis on ipRGCs is somewhat misplaced, given the outcome of the experiments. A succinct summary of our assessment is as follows (this is a lightly edited comment from that discussion). "The scientific content reveals, simply, that the number of TH+ cells as well as DA content are both reduced following dark-rearing, and these effects are mediated by the rod pathway and independent of the ipRGCs. There is no clarification of the relationship between these two measures, and so the issue of DA function, so central to the Introduction, goes entirely unresolved. The issue of altered TH levels, rather than DA cell number is also a concern that the authors themselves raise. The assessment of DA cell morphology is not convincing. Overall, the manuscript is strong on making one point: that light, via the rod pathway, is critical for establishing the number of TH+ cells during development." Dopamine (DA) release in the retina is modulated by light exposure, affecting retinal circuitry that mediates our visual abilities under different light-adapted states. Recent studies have drawn attention to the role of intrinsically photosensitive RGCs (ipRGCs) as a possible mediator of the effects of light upon the DA cells, because of their anatomical and physiological relationship. The present manuscript sets the stage for addressing this issue, but in fact tackles another, that of whether light exposure during development affects the size of the DA cell population, and whether this effect is mediated by the ipRGCs, or instead by the rod or cone photoreceptors. The authors find that dark rearing yields a significant reduction in the population of DA cells. The effect is detected as early as 2 weeks of age, shortly after eye opening, and is comparable to dark-rearing until maturity (P50-90). Returning mice to a standard L/D cycle at P14 until maturity did not return the number of DA cells to normal levels. A similar effect was achieved by comparing genetically engineered mice that lacked all ipRGC, rod and cone function (TKO); these too showed a reduction in the number of DA cells. In each comparison, the authors also assayed retinal DA content, and found a significant reduction as well. To dissect which photosensitive cell is critical for mediating this light-dependency, the authors examined single KO mice lacking either ipRGC function, rod function or cone function, and repeated the analyses. DA cells and DA content were significantly reduced in only the mice lacking normal rod function; no significant effects were achieved in mice lacking phototransduction in either the ipRGCs or the cones. The authors confirmed that this rod function effect is not mediated through the ipRGCs, as ablating the latter during the first 2 postnatal weeks did not affect DA cell number nor content. 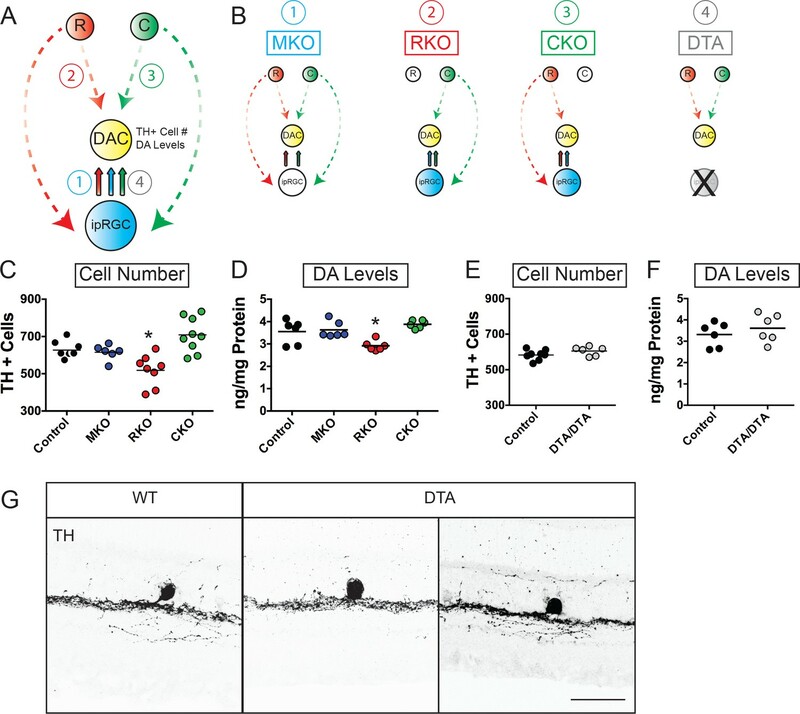 Finally, the authors suggest that even in the absence of normal ipRGC number in this DTA mouse, the DA cells develop normally, evidenced by their characteristic stratification. The inclusion of the analysis of DA content would, on the face of it, entitle the authors to make claims about light via rod-signaling regulating DA function, yet it is not clear whether the reductions in DA content are simply the knock-on consequence of fewer DA cells in each retina. So, one question that goes unanswered is whether the rod pathway is in fact a modulator of retinal dopamine levels, as concluded in the final sentence of the abstract. It seems surprising that the authors have not discussed this, but a closer examination of the data presented might suggest why: while the magnitude of the reduction in DA levels in Figure 1C is quite large relative to the magnitude of the effect upon DA cell numbers in Figure 1B caused by dark-rearing (suggesting that the former is not simply due to the reduction in cell number), a comparison between the TKO versus controls suggests a closer relationship. This is also suggested by the data comparing the RKO versus controls for these two measures. So, the authors may have concluded they cannot say anything definitive about rod-signaling during development ultimately affecting DA function in maturity independent of the reduction in DA cell numbers. The Introduction, in its concluding paragraph says, correctly, that they have tested whether light signaling via ipRGCs plays a role in DA cell development, yet then sums up by proclaiming it is the rod signaling that is responsible for the effect of light on DA cell development "and function". This latter stretch as indicated above, would seem to be for the purpose of bringing the results full circle, back to the fundamental issue of how light affects DA cell function (as opposed to how light exposure during development affects DA cell number and DA content). The authors visually magnify the effects upon cell number by using a truncated Y axis beginning at 300 cells. It would be preferable for the authors to at least quote the means and sem within the text for each group, as well as speak to the magnitude of their effects (i.e. the size of the reduction, for both cell number and DA content). This is not to diminish in any way their solid claims showing an effect upon cell number-only that it is a very modest one. It also forces the consideration of whether the effect upon DA content might be solely explained by the reduction in DA cell number. The authors point out the variability that can arise between different HPLC runs, ensuring that the controls for each comparison were run at the same time. This though cannot account for the variability in the magnitude of the effect between the different comparisons. By contrast, the number of DA cells is itself a more stable trait, though one that is known to vary across mice of different genetic backgrounds. This presumably accounts for the lower number of DA cells in the control condition in the DTA study, and the higher number in the control condition in the dark-rearing study, relative to the two replications of the control condition when comparing the TKO or the SKO to controls. Presumably all of the control mice used in these experiments are on distinct genetic backgrounds. With respect to the argument that DA cells develop normally in the absence of ipRGCs, the degree of assessment is rather limited, confined to a qualitative examination of stratification patterns, though not of detailed single cell morphology or of the extent of the density of processes. If anything, the imaged cells from the DTA retinas would appear to show less processes outside of S1 of the IPL, implying stratification may very well be affected. Manteanu et al., have written a clear manuscript about the effects of rod-, cone-, and melanopsin-mediated pathways on the development of the number of dopaminergic neurons in mouse retina. Previously, the leading hypothesis was that melanopsin ganglion cells influenced the development of dopaminergic neurons because of their close functional association in mature retina. The authors use four transgenic lines that specifically knockout rod, cone, melanopsin, and all photoreceptor function. Quantification includes a count of tyrosine hydroxylase positive neurons in adult retina. The conclusion is that elimination of rod function decreases the total number of tyrosine hydroxylase-positive neurons; however, elimination of cone or melanopsin function alone is insufficient to change the number of TH-positive neurons. A potentially major flaw with the interpretation of this manuscript is a point that the authors raise themselves in the last sentence of the Discussion section. The decrease in tyrosine hydroxylase-positive cells may not be equivalent to a decrease in the number of dopaminergic neurons if the TH levels have just decreased. A more general cell count number would help support the main finding of the manuscript. Are there alternative ways of labeling dopaminergic amacrine cells? The rod transducin knockout eventually causes rod degeneration between 4-13 weeks (Calvert et al., 2000), which is the window over which cell counts are made. Have the authors considered the possibility that the rod manipulation causes photoreceptor degeneration and secondary cell death as a broad affect rather than a specific effect of the loss of rod function? The other cone and melanopsin knockouts are not known to cause retinal degeneration. This difference in retinal degeneration could potentially explain their results. The aim of the study by Munteanou et al., "Light-dependent pathways for dopamine amacrine cell (DAC) development and function," is to determine whether melanopsin-expressing intrinsically photosensitive ganglion cells (ipRGCs), which are known to control DAC activity, play a role in DAC development. The first set of experiments reveal that mice reared in constant darkness have a lower number of DACs and lower dopamine levels in the retina compared to mice reared on a normal light/dark cycle. Mice that lack functional photoreceptors (rods and cones and ipRGCs) have lower numbers of DACs and dopamine levels, similar to those in animals reared in constant darkness. Genetic elimination of cone function or ablation of ipRGCs has little effect on the elevated DAC number and dopamine content observed under normal rhythmic light/dark conditions. However, in mice that lack functional rods, the number of DACs and dopamine levels are low and similar to those measured in animals reared in constant darkness. The results suggest that normal light/dark cycles are required for the normal development of DACs and normal dopamine production. Surprisingly, the results further suggest that melanopsin and ipRGCs are not involved in the process and instead, rods (and cones?) seem to be required and sufficient. 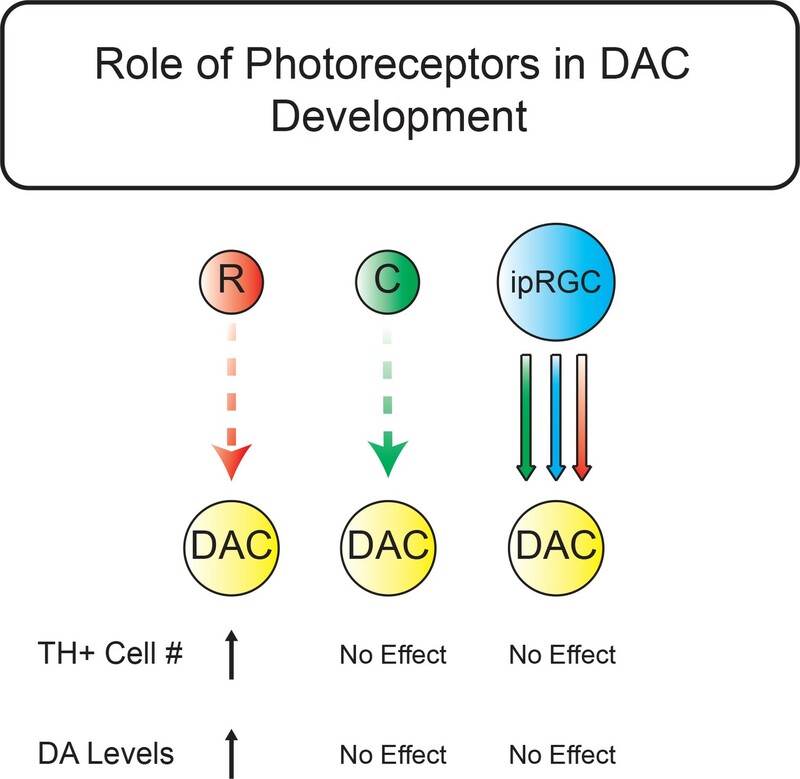 Overall these findings provide evidence that conventional photoreceptors play a role in the control of DAC development and that surprisingly ipRGCs are not involved in this process. The results should be of broad interest to the scientific community including circadian biologists, vision scientists, as well as neuroscientists in general. The experiments are carefully done and interpreted appropriately (but see my comment on Gnat2cpfl3/cpfl3). The manuscript is well-written and the logic easy to follow. Overall, this is a well-executed study that reports exciting new findings with significant ramifications. 1) Throughout the manuscript, the notion that "light exposure is required to set the number of TH+ cells and dopamine levels in the retina" is vague and somewhat misleading. What is important here is the role of prolonged exposure to light every day for 12 hours. That is, a normal light/dark cycle is required for normal DAC development, as opposed to constant darkness. This should be clarified. 2) Results section: The authors should give more information about the timeline of the experiments in which animals were placed in DD and subsequently in LD and in particular, when these animals were euthanized. Also, in the Figure 1 legend, please define adult age. This information is the Materials and methods section but should be stated in the main text as well. 3) Results section: Correct the typo in Gnat2cpfl3/cpfl(2)3. The authors should be cautious with their interpretation of the Gnat2-/- results: Gnat2cpfl3/cpfl3mice do have cone function but with a much lower sensitivity. The light intensity used in this study (app. 2,000 lux) is well above cone threshold. Therefore, the authors cannot exclude the contribution of cones in DAC development. Still, the main conclusion of the paper remains unchanged: ipRGCs and melanopsin are not involved in the control of DAC development by light. As mentioned in the initial paragraph, we distilled this summary into three main points based on our understanding of the paragraph above. Our responses and accompanying changes are detailed below. 1) Change the focus of the Introduction to better reflect the findings reported in the manuscript. The reviewers make an excellent point that the Introduction emphasizes ipRGC function, but that the data clearly indicate an important role for rods via an ipRGC-independent pathway. We have edited the Introduction to better introduce how each of the three photoreceptors provides input to DACs. We do think it is important to emphasize the fact that ipRGC-dependent influences was a prevailing hypothesis prior to this work, but hope that the Introduction now provides more complete and relevant background information. We thank the reviewers for this suggestion as it enhances the clarity of the manuscript and better prepares the reader for the upcoming data. 2) It is unclear whether reduced TH+ cell number is a function of cell loss or decrease in levels of TH within the cells. One limitation of this study is our inability to determine whether DACs are actually lost or whether TH levels are decreased leading to lack of detection of DACs. This is an issue that we are keen to overcome, but we have not able to identify reagents that would let us address this issue with interpretable results. For example, mouse lines that would permanently label DACs (DAT-Cre, TH-Cre) label multiple, additional (and not entirely overlapping) populations in the retina(1). Additionally, the TH-RFP reporter line labels additional retinal cell types beyond the canonical DACs and is dependent on TH levels for reporter expression. Similarly, any cell death analysis would continue to rely on TH expression as a proxy for the presence of DACs, and is therefore fraught with the same limitations or interpretation of the results as immunolabeling for TH. We have therefore expanded our discussion of this issue within the manuscript. 3) Better illustrate DAC morphology in Opn4DTA versus WT retinas. The reviewers have pointed out that, as presented, the morphology of WT and Opn4DTATH+ cells might be construed to be different. We thank the reviewers for bringing this to our attention. We have included 10 additional examples of each genotype as a supplemental figure (Figure 2—figure supplement 1) to demonstrate the natural variability of the TH+ process stratification and more clearly demonstrate that our examples fall in the normal range. This is referenced as Figure 2—figure supplement 1 in the text. We thank the reviewer for pointing out the incongruity between the content of our intro and the results obtained in the study. We have edited the Introduction to better reflect the upcoming results (see Point 1 above). We removed the phrase “and function” from the last line of the Introduction and from the title of Figure 3. Regarding the differences in DD/LD versus the genetic manipulations: It is important to note that the light intensities used in the LD versus DD condition were brighter (~2000 lux where the animals were all reared in light tight boxes) than those used for the mutant lines (~100-200 lux, where the animals were reared in the animal facility). It is therefore possible that the increased light intensity results in higher dopamine levels and so the proportional decrease between LD (2000 lux) versus DD is more dramatic than for the other conditions. The DA measurements were run in different batches, and so the absolute DA levels cannot be directly compared between the two experiments. We have also expanded our discussion of the issue of whether the decreased DA levels are solely the result of lower TH+ cell number or whether there is also potentially a decrease in TH levels in the remaining TH+ cells. We thank the reviewer for this suggestion and have added the numbers to the text as requested. We have also expanded our discussion on the point of whether the DA decrease is due solely to loss of DACs themselves or potentially also due to decreased DA production by the remaining TH+ cells. We did indeed use littermate controls for each experiment in order to prevent any differences due to variability of genetic background. Each of our mouse lines is on a hybrid C57Bl6/129 hybrid background, meaning that the controls of different strains could indeed have slightly different genetic backgrounds, making the littermate control condition doubly important. We thank the reviewer for pointing out that our images suggest differences between the WT and the DTA lines. We now include 10 additional WT and DTA examples that demonstrate the natural variability in the stratification of TH+ processes in both of these lines. We include these data as a supplemental figure (Figure 2—figure supplement 1) to illustrate better similarity to the WT image in the main figure and have swapped out one of the DTA examples in the main Figure 2. We agree with the reviewer that we are unable to resolve whether the cells have been completely lost or are simply not producing TH at detectable levels. For the reasons mentioned in response to the general summary, we are unable to identify a way to label this population of cells reliably as available reagents either label additional amacrine cells in the retina or continue to rely on TH expression. However, it is important to note that the decrease in TH does indicate that even if the cells themselves are still present, they are not expressing an enzyme critical for DA synthesis and therefore, they are effectively no longer “dopaminergic.” Thus, though we cannot clarify the reasons for the absence of TH immunolabeling, it is clear that dopamine production from a subset of DACs is lost or at least severely attenuated in dark reared mice or mice lacking rod phototransduction. This is an important point and we thank the reviewer for bringing it to our attention. We don’t think that this explains the effect because we are able to recapitulate the phenotype in dark-reared animals where there is not retinal degeneration (2). Nonetheless, we have added a discussion of these two important points to the Discussion section. […] 1) Throughout the manuscript, the notion that "light exposure is required to set the number of TH+ cells and dopamine levels in the retina" is vague and somewhat misleading. What is important here is the role of prolonged exposure to light every day for 12hours. That is, a normal light/dark cycle is required for normal DAC development, as opposed to constant darkness. This should be clarified. We thank the reviewer for pointing out the vague language and have attempted to clarify the language at the beginning of the results to say “we first tested whether exposure to a 12:12 light: dark cycle influences the number of TH+ amacrine cells in the retina” to highlight this aspect of the experimental design. This is an excellent point. We have added altered the description in the opening paragraph of the results to read, “[…] in the retinas of animals that were reared in constant darkness from conception” to clarify that animals bred, and their pups reared in constant darkness. We have also added the term “from conception” to the description in Figure 1. 3) Results section: Correct the typo in Gnat2cpfl3/cpfl(2)3. The authors should be cautious with their interpretation of the Gnat2-/- results: Gnat2cpfl3/cpfl3 mice do have cone function but with a much lower sensitivity. The light intensity used in this study (app. 2,000 lux) is well above cone threshold. Therefore, the authors cannot exclude the contribution of cones in DAC development. Still, the main conclusion of the paper remains unchanged: ipRGCs and melanopsin are not involved in the control of DAC development by light. We thank the reviewer for bringing this important point to our attention. We have added a discussion of this point to the Discussion section. We would like to thank Jennifer Y Li for technical assistance with mouse husbandry and genotyping. We would like to thank Samer Hattar for the gift of the mouse lines used in this study. This work was funded by the Karl Kirchgessner Foundation Vision Research Grant and a Klingenstein-Simons Fellowship in the Neurosciences to TMS. Animal experimentation: This study was performed in accordance with the guidelines of the Animal Care and Use Committee at Northwestern University. (Protocol number IS00000887). © 2018, Munteanu et al.